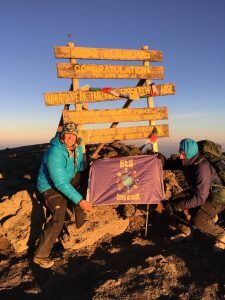 After reaching the summit on the 27th, we returned to Barafu at 15,331 feet and then hours later went back up to the summit on the 28th with the team. So, we went from 13,500 to 15,331 feet, then without sleep went on to the summit at 19,341 feet, turned around and went down to 15,331 feet, rested a few hours and went back up to the summit at 19,341 feet and flew off. In just over 24 hours climbed up and down a total of 13,861 feet all at altitude over 13,000 feet. Second summit on Sept 28th in less than 24 hours.